Arora is Named One of The Philadelphia Business Journal's Best Places to Work 2018 - Arora Engineers, Inc.
Arora Engineers, Inc. is honored to be named one of The Philadelphia Business Journal’s Best Places to Work 2018. Each year, The Philadelphia Business Journal partners with Quantum Workplace to honor the top companies to work for in the Greater Philadelphia area, as voted on by the people who know them best – their employees. In order to be included in the list, a company has to reach a statistical target based on their employees’ responses to secure, anonymous surveys. The surveys include sections on work environment, personal growth, professional development, and embracing change and new ideas. 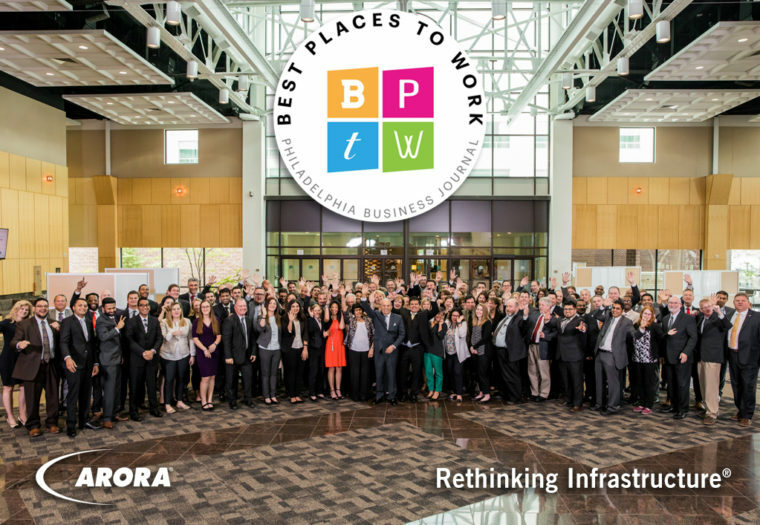 “Being recognized as a Philadelphia Business Journal Best Place to Work is a tribute to the people who make Arora not just a workplace, but a home. I’m very proud to see this culture, and life at Arora, thrive through open communication, entrepreneurship, and mutual respect,” says Manik Arora, PE, President & CEO. The winning firms will be honored at an awards ceremony on Thursday, August 2 at The Fillmore Philadelphia.